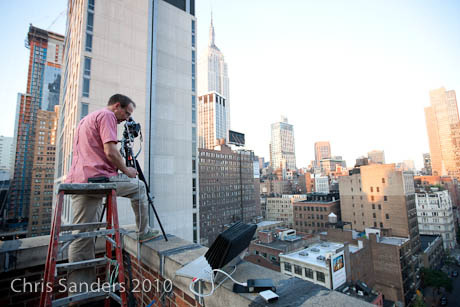 I was shooting an outdoor party set-up for Kimpton Hotel Group at the new Eventi hotel here in New York City. It’s conveniently right around the corner from my office at 29th and 6th Avenue. The outdoor space is a patio deck area that is five stories up and I thought it would look great from the building next door. 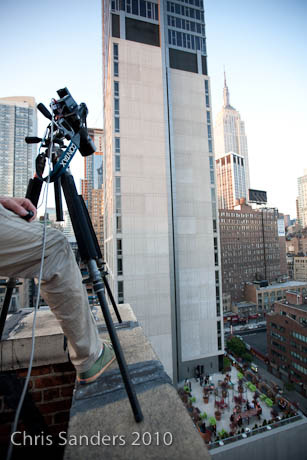 We got our models in action, lit the set-up, and then went to the roof. We didn’t need walkies for this just used our cell phones to call out directions. I love the blurs of the taxis down below. I shot from sunset until just after dusk to get a variety of light. We used hotlights and HMI so I could see the lighting ratio with my eyes and I then was able to call in for gel changes right away. These behind the scenes photos were taken by Tom Judge.